Taking care of your Venus Flytraps over the long run – buddies for life! 4) not overwatering (keeping your Venus Flytraps hydrated, but not sitting in water for more than a day or two). Above and beyond these basic critical points of care for your Venus Flytraps, there are additional things you can do to optimize the health of your Venus Flytraps. First and most importantly, re-potting each year, or even better, every 6-9 months. Venus Flytraps love a re-pot, because minerals build up in the growing medium and deter optimal growth, even possibly killing your Flytrap if you leave it in growing medium for too long. After you re-pot your Venus Flytrap in fresh mineral-free growing medium, it will usually take a few weeks to recover, up to a month depending on how much the roots were sheared (which is almost inevitable, especially if unpotting from premium long-fibered sphagnum moss which intertwines with the roots of the plant but is also an excellent growing medium so is worth it to many Venus Flytrap growers). Another care technique above and beyond the Critical 4, is keeping your growing medium weed-free and carpet moss-free. Other types of plants will try to grow in the same pot with your Venus Flytraps, but their roots can steal water from your Flytraps, their foliage can overshadow them and steal UV light, and some plants can even actively suffocate the plant, like carpet moss will do if allowed to overrun the surface of the growing medium. 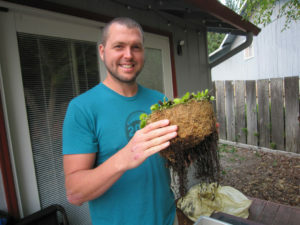 To remove other plants, try to remove them from the root, so not just picking off the top, or else it will just re-grow. Carpet moss can be peeled off, but often carpet moss requires a re-pot, because it just keeps coming back if you leave even a tiny bit. Another helpful activity in caring for your Venus Flytraps, is to remove dead blackened pieces. It’s really not necessary at all unless the dead traps and covering the green parts from getting UV light from above, but it’s good to clean it up for your own enjoyment in terms of aesthetics, and also before too much dead foliage does end up blocking UV from the plant. If there is any green at all, you don’t want to trim that from the plant, as it is still contributing to photosynthesis to feed your Venus Flytrap. The parts that are ready to be cleared away are usually very easy to remove, as they become very crispy and dry. Anything resistant that is totally blackened you can use snippers or scissors to carefully remove from the alive parts of your Venus Flytrap. An additional extra care tip that some Venus Flytrap growers do is to mist their Venus Flytraps with mineral-free water during the extreme heat of the summer. It’s not terribly helpful to cool the plant; it would be better to move the plant to dappled light such as under a tree, for example, if it’s really that hot. If you have your Venus Flytrap potted with enough growing medium around its rhizome, a 3″ periphery is usually good, and in an insulated pot, then misting or removing the plant from the heat isn’t usually necessary. But some growers like to do it, to pamper their Flytraps and actively interact with them. Also in the realm of temperature control, if the temperatures go above 90F or so, it is helpful to keep your Venus Fly Trap out of the hottest sunshine, moving it to shade or dappled light after 1:00 p.m. or so, but making sure it gets all the morning and early afternoon sunshine. Venus Flytraps can handle heat and cold along the same lines as humans, so if it’s too hot or cold for you, it probably is for your Venus Flytrap, too. That said, Venus Flytraps can handle a lot of heat, so it’s not necessary to move them out of the high heat, but it is something they appreciate. Many humans reward themselves and others with a tasty food treat. Venus Flytraps do not actually require food other than that they can make from the sunshine with photosynthesis and chlorophyll. However, they do appreciate a treat, and feeding your Venus Flytraps does help them grow faster if that’s what you’re looking for. Venus Flytraps can eat almost any naturally occurring bug that will fit in their trap (not counting spider legs which will often sprawl out outside of the trap after your Flytrap has ingested the body in the trap). Hard-shelled bugs do tend to eat holes through your Venus Flytrap traps, so they are better to avoid. And please, no human food, like hamburger. Human food is very bad for Venus Flytraps, just bugs/worms only, please, for your munching Flytrap friend. Each Venus Flytrap trap can eat about 5 bugs, or 5 times, and then will perish. But new baby traps should be coming up at all times, even during Dormancy, so not to worry! Digesting a meal takes about 3-5 days for a Venus Flytrap, during the summer or active growing season. During Dormancy it can take much longer, up to weeks. Digesting a meal during Dormancy might even mean the end of that trap after 1 meal. That is because during Dormancy Venus Flytraps are putting most of their energy into just being chill and keeping energy stored into their rhizome or “bulb.” The priority during that time is not to be active, which digesting meals requires, but rather to hunker down and save what the Venus Flytrap has stored up already in its rhizome. A meal can be very taxing, even though it can provide nutrients in return. So, if you feed your Venus Flytrap during Dormancy, do so sparsely. If your Flytrap is outside as it should be, it usually catches enough meals on its own, and you don’t usually need to supplement. But, a nice dessert fed to your Venus Flytraps is a nice little boost to growth. Above and beyond the 4 Criticals, additional care includes protecting your Venus Flytrap from extreme heat and cold conditions, feeding, trimming and weeding, and re-potting with fresh mineral-free growing medium. These additional care steps are optimal for providing your Venus Flytraps with the best care possible. Happy caretaking!